Lets face it. The average employee is stressed. And chronic stress can lead to decline in cognitive function, creativity, productivity, and other serious health concerns. Chronic stress, if not dealt with effectively can also lead to long term burnout and absenteeism, where employees aren’t performing at their peak potential, and missing work as a result. Data show that 36 percent of workers suffer from work-related stress that costs U.S. businesses $30 billion a year in lost workdays (Source: Harvard.edu). Over time, this translates to big business. According to a new survey from the Harvard T.H. Chan School of Public Health, “Nearly half (44 percent) of working adults say that their current job affects their overall health, but only 28 percent of those believe that effect is a good one. People say their job has a negative impact on their stress levels (43 percent), eating habits (28 percent), sleeping patterns (27 percent) and weight (22 percent). One of the most important investments companies can make in the next decade is in workplace wellness and stress management. In the last few decades, corporate wellness started off with providing employees with a discounted gym membership, or healthy snacks in the kitchen area. But now, Workplace Wellness is much larger than that. Research has shown that the most successful Wellness programs help their employees thrive from a physical, emotional, mental and financial standpoint. It’s about educating your workforce on healthy diet and lifestyle habits, so that they not only thrive in their work environment, but also in their personal lives. Workplace wellness is about providing your employees with a menu of wellness options to help them reach their highest health potential -- across nutrition, stress, sleeping habits, relationships, weight loss, and more. As a result, this will improve the well-being of their workforce, improve business results and build a great company culture. 1. Set Wellness Vision and Goals – Where does every employee want to be from a career and wellness perspective? What does the ideal “them” look and feel like? Empower supervisors or a Wellness expert to walk through this exercise, and help employees articulate their “wellness vision” on paper. In addition, another really powerful exercise is creating a 2017 Mind Map. which is an exercise former Google career coach Jenny Blake advocates. This is a powerful visualization tool, and helps employees set clear career and wellness intentions, priorities and focus for the upcoming year, 5 years, even 10 years. An organization can even scale this exercise company wide as an interactive performance kickoff for the year. 2. Fuel Employees with Nutrient-Dense Foods - Stress and nutrition go hand in hand. The average employee is sitting at their desk downing cups of coffee, sugar laden snacks, energy drinks, and empty calories. This is fueling insulin spikes, crashes and poor metabolic function. This is bad news for energy levels, performance and overall happiness in the workplace. Additionally, when our bodies endure times of stress – three primary stress hormones are released, adrenaline, cortisol and norepinephrine. These are our “fight our flight” hormones causing our bodies to increase levels of blood sugar (glucose) to feed our heart, muscles, and brain to handle the stress successfully. After that initial burst of energy, we typically crash and need nutritious foods to replenish. Provide healthy nutrient-dense whole food snacks, filtered water, and teas available to your workforce to promote optimal health and lower stress levels. Explore partnering with a healthy food vendor or company to deliver healthy lunch or breakfast once a week to promote experimentation and adoption. In addition, partner with a Nutrition expert to provide healthy recipes, cooking and meal preparation demonstrations to empower employees to eat healthy at home and with their families. Remember, educating employees on how to make healthy food choices is far more valuable and sustainable than just providing healthy food options. 3. Make Time for Stress Relief, Balance and Relaxation– Americans don’t take vacations – on average they work 60+ hours a week and there is very little down time. They are hunched over their computer screens, phones, and tablets responding to emails most of the day and into the night. As a result, this increases our stress responses and decreases our relaxation responses. This takes a tremendous toll on someone’s mind and body health. Remember, no amount of kale will counter repetitive chronic stress responses in the body. Because of that, employees finding time to unplug and unwind is critical. Every person needs to find respite, whether it’s mindfulness, meditation, a brief walk in nature, deep rhythmic breathing, a massage, taking a vacation, or stowing electronic devices every night when you get home. These are all exercises that help employees defrag from the 24/7 bombardment of emails, meetings, obligations and stress. Encourage employees to find this balance in the office and home environments. 4. Designing an Environment for Wellness - A relatively new trend is emerging in wellness architecture and design. In Boston, there was a recent UNITE Live Well/Work Well panel sponsored by the Design Museum Foundation, that explored how smart workplace design is positively affecting the wellness and performance of several high profile companies. Factors like natural light, air purification, acoustics, the interaction ecosystem, open workspace, giving people space to gather, and space to retreat, all factor in the health and happiness of your workforce. A Workplace Futures Team of Steelcase study of 10,500 workers in Europe, North America and Asia released in November 2014 found that employees surveyed said they got interrupted every 11 minutes. And then an additional 20+ minutes to refocus and realign. Smart workplace design can minimize these types of interruptions, ensuring employees are in an environment and ecosystem that maximizes performance, productivity and focus. 5. Create a Culture of Wellness – If wellness is a one-off event or initiative, research has shown that it is not sustainable. Wellness needs to be engrained in the companies’ DNA with top-down leadership adoption. Yes healthy snacks and a gym membership are great starters, but organizations should take it a step further to empower employees to make sustainable nutrition and lifestyle changes that will lead to lifetime health transformations in and outside of the office. Educating and equipping your workforce with valuable tools and strategies will lead to lasting sustainable wellness change within your organization, and empower them to make the changes in their life beyond the 9-5. Provide wellness workshops and seminars, employee newsletters, posters to reinforce healthy lifestyles, an organic garden that everyone an help nurture and harvest from, stress management tools, individual nutrition coaching, healthy cooking demonstrations, weight management classes and more. Encourage employees to participate and keep the dialogue open on what wellness programs are most effective in achieving their wellness goals. Lastly, get creative on how you can include employees families as well, whether it’s hosting a company wide fitness day, or wellness materials or information they can bring home and help their family adopt. Try to make wellness programs scalable beyond the workplace, so that employees share with all the important people in their life, and create a wellness ripple effect in their local communities, and beyond. Immunity Boosting Wellness Shot | "Flu shot"
With this record flu season… you want a REAL flu shot? Not getting anywhere with the over the counter synthetic meds that don’t treat symptoms and come with horrible side effects? Try this flu shot and attack the root of the issue and start to feel better in a few days! · A pinch of cayenne pepper. This super shot boasts anti nausea, anti inflammatory and antioxidant compounds. Add this to your wellness arsenal, and get ready to feel a LOT better, FAST. We were in Martha’s Vineyard for our annual family vacation. The West Tisbury farmers market was brimming with fresh local produce, flowers, and artisan items. It was one of the most beautiful and lush farmers markets I had ever seen. We picked out some fresh garlic and parsley from Morning Glory farms, local butter from Grey Barn Farm and then headed down to Larsen’s Fish market in Chilmark to pick out some fresh fish. That night, we paired everything together to make a light, buttery and flaky, melt in your mouth Halibut dish. · First, line a medium to large baking sheet with aluminum foil or parchment paper. · Next, drizzle the olive oil over both sides of the filets so they are adequately coated, and lightly salt and pepper each side. Lay both filets flat on baking sheet skin side down. · Add generous layer of panko breadcrumbs on top of each filet so that they are adequately coated. Add garlic cloves on top and another drizzle of olive oil. · Bake filets for about 25-30 minutes at 375 depending on thickness. The trick to moist, light and flaky filets is not to overcook the fish, so I like to check progress every 10 minutes or so. When the fish is about 75% done, pull from the stove, and add a generous pad of butter on top of each filet. · Next, broil for last 5 minutes so that breadcrumbs toast and top, and the butter melts over the filets. · Pull from oven and add chopped parsley, fresh lemon juice, and serve warm. This is one of my favorite comfort foods on a cold day. There’s something about stuffed artichokes that warms your soul. An italian staple. Healthy and delicious. Simply divine. 1. Prepare and clean the artichokes. Cut top off (1/2 inch) and clip all tips of leaves so leaves are flat, making room for the stuffing. Stretch artichoke so that there is adequate space between each leaf. 3. Stuff each artichoke, making sure the stuffing gets between the leaves and deep in the crevices. 4. Lay each artichoke flat in deep dish non stick pan. I can usually fit 6-8 to a pan depending on size. 6. Pour layer of chicken broth on bottom of pan to ensure they don’t burn (about 1 inch of liquid. Don’t worry, it will evaporate!). 6. For the last 10 minutes, take out the artichokes and spoon 1 tablespoon of crushed tomatoes over each artichoke. Bake for another 10 mins. 7. Garnish with fresh thyme from the garden. 8. Let cool for 10 mins, and serve. And she’s entirely right. Ina Garten is one of my favorite chefs. Starting with the best ingredients and cooking simply without a ton of ingredients brings out the best flavors in foods. That’s how my mother always cooked, and it’s how some of the best cooks cook today. Every summer, I used to go home and my dad would bring out the best tomatoes from local farms in New England. 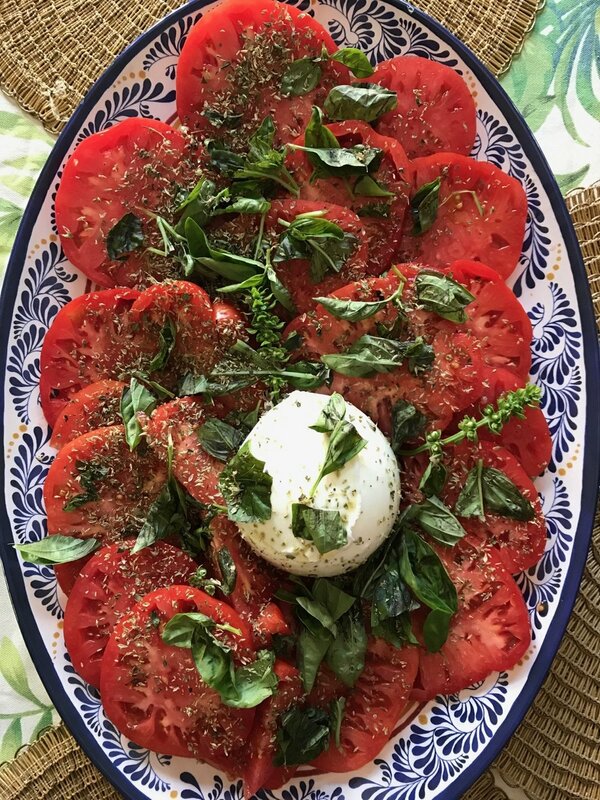 We would slice them and layer them with creamy buffalo mozzarella, fresh basil from the garden, Italian EVOO and a special aged balsamic from Italy. We would eat outside with a good bottle of red, crusty Italian bread, and watch the sunset. Heaven on earth. ● 4-5 large summer beefsteak heirloom tomatoes sliced thin. Salt adequately to “bleed” them as my mother would say, or draw out the juices. ● Buffalo mozzarella or Burrata. Make sure you buy the kind that is still in the brine as it’s the freshest and juiceiest with best consistency. ● 10-15 basil leaves from the garden, chopped. ● Drizzle of thick balsamic. (Dad's choice: Gemma Nera from Italy). ● Loaf of crusty Italian bread (In Massachusetts, we like this company called Iggy’s which is located in Cambridge, or any of the Italian breads from the North End, especially in Boschetto’s or Parziale’s Bakery). ● Layer all ingredients evenly on a large white platter or dish. Start with tomatoes, then mozzarella, then basil, drizzle with lots of EVOO, and a touch of balsamic. Finish with a sprinkle of dried oregano or fresh if you have in your garden. Serve immediately with crusty italian bread. For those of you who know me, know that I’m a huge advocate of manifestation and the Law of Attraction. This law states that you will attract to you those people, events and experiences that match your state of being. If you focus on having gratitude for the love, companionship and joy you have in your life right now, you will attract more of that into your life. If you focus on what you don’t have, you will send a message of lack and you will attract more lack into your life. I am not shy to say I have created dream vision boards and seen the specific things I have requested come to life over and over again. I truly believe that our thoughts become things. That’s right. Whatever you are thinking right now, the universe is intently listening to and moving mountains to make that happen for you. Yes, this is magic. So, how do you do it? Below are my top secrets and tips. Intentions are the starting point of every dream. It enables us to harness the creative power that fulfills our needs – whether for wealth, relationships, spiritual growth, or love. In fact, every thing that happens in the Universe begins with intention. When you crystalize what you want to manifest, start setting daily intentions in the morning. This will help focus your energy for the day, and consciously make decisions that align with that vision. Try creating a vision board. Display pictures and words that encompass what you want to manifest. Remember, the more specific the vision, the better. Crystal clear visions are easier for the Universe to manifest. Also, keep your visions to yourself until they manifest. Talking may disrupt the informational field and confuse the Universe. Instead, spend your energy and efforts on holding that vision firmly in your heart and mind and recognizing cues from the Universe to take action at the right time. Good things take time. In order to achieve stable and long lasting results you have to take things step by step, let go, and learn to trust the Universe. I always like to say “Hold the vision, trust the process.” Remember, your focused and clear intentions set the infinite power of the Universe in motion. When you let go of controlling the outcome and fully trust, you have released your intentions into the garden of infinite possibility. The Universe will deliver them to you in physical form when the time is right. A wonderful daily habit is writing down five things you’re thankful for every morning. Gratitude is a very powerful tool for spiritual and emotional growth, and also for manifesting what you wish for in this life. Saying you’re thankful for certain things tells the Universe, “Yes, I want more of this in my life!” This process connects us with our happiness and quickly turns negatives into positives. A powerful tool is creative visualization, and imagining what you want to manifest from a third person perspective. The best manifesters receive what they want by effectively seeing themselves in their visualizations. If it’s a new car you’re after, picture your hands around the steering wheel, the way your leg feels on the leather seat, the sound of the engine. Concentrate your energy on the hologram of your dream or wish. Align your emotions and thoughts to what you would feel like you already have it. That way you are feeling at that present moment, is attracting more of that into your life. Activate your radiant, magnetic self and become the best version of yourself. Keep your eye on the prize, trust the Universe, and watch the blessings roll in. More than 50 million Americans suffer from sleep problems that affect their health, and constantly reaching for more sleep medication is never recommended. Massage with both light and deeper pressure have been found to trigger the body’s release of serotonin, a neurotransmitter responsible for feelings of calm and comfort. Massage has been clinically proven to stimulate the body’s production of lymphocytes, white blood cells that help protect the body from disease. Not only that, but studies have shown that massage has an inhibitory effect on cortisol, the body’s stress hormone. Way, way too many people develop neck, shoulder, or lower back pain and say “Well, this is my life now…” No it’s not! Massage therapy is not just for relaxation—it goes right to the site of muscular pain and kneads it into oblivion using a combination of trigger point work, muscle stripping, and connective tissue release. Therapeutic massage can be delivered with light, firm, or deep pressure and can be used to treat headaches, carpal tunnel, sciatica, shin splints, and a host of other muscular maladies! Time to show that frozen shoulder who’s boss. Although individuals with untreated hypertension are advised to check with their doctor before booking that back rub, studies have long shown the positive effects of massage on diastolic and systolic blood pressure. The slow, stroking movements of a professional massage produces a sedating effect that activates the parasympathetic nervous system, the body’s “rest and digest” mode. This stimulates the Vagus nerve to slow down heart rate, which lowers blood pressure and leads to a sense of relief and peace. Massage therapy, “The Art of Laying Hands,” is an ancient technique that works by harnessing the body’s natural ability to heal itself. There are over 200 different styles of massage, each designed with their own unique blend of relaxation, pain relief, and spiritual balancing. As society moves faster and we become more detached from fellow human beings, having someone touch you with compassion can be crucial. You are never just a number to your massage therapist—whether you chat during your treatment, remain completely silent, or just fall asleep (all of which are totally fine! ), simply being one-on-one with someone whose sole focus is YOU may be all the vacation you need. Getting burnt out from reality tv and mindless television? Looking for deep, rich informative content that will feed your mind, body and soul? And, most importantly help you reach optimal health?! Over the last decade, the number of food and health documentaries has exploded and the information available to us now is shedding light on rather taboo subjects the food industry might not want us to see. And the best part is, the stories are fun, compelling and in most cases unforgettable. Whether you’re looking for inspiration to help clean up your diet, eating habits or interested in learning more about food politics, arm yourself with the information you need to make the best nutrition and lifestyle decisions. Watching a food documentary is a great place to start and fun for the whole family! This documentary discusses how many health issues and conditions can simply be treated through healthy diet and nutrition. A compelling and informative film, and a great place to start. This documentary drives awareness of the hidden sugar in most of our diets, and how this white powder is slowly but surely wreaking havoc on our health, our bodies and overall wellness. You would be surprised how much it's hidden in proclaimed "healthy" foods! If you’re trying to kick the sugar habit, this one is a must see. This winter dish is one of my favorites. My mom makes it with steak and a salad and we are in heaven. Plus, with a healthy serving of garlic and onions, this powerhouse couple provides nutritional support for cancer prevention, detoxification, and helps lower cholesterol. 4. Next, slice russet potatoes very thin with a mandoline or by hand. Add a layer of potatoes on next. 5. Next, add light layer of chopped rosemary, thyme and chives. 7. Repeat same sequence of layers until finished with ingredients or casserole dish is full. 8. Finish with a few cherry tomatoes on top and fresh herbs for presentation. 10. Bake at 350 for 1 hour until crispy on top. Serve immediately. Are you tired of the coffee crashes and 3pm afternoon slump? Trust me, I’ve been there. When I was working in Advertising, 3 cups of coffee a day just wasn’t cutting it. I needed a clean, sustainable energy source that would nourish my cells on a deeper level, without the addiction or the crashes. Something that would balance my mood and keep me alert and focused throughout the day. After going though Nutrition School, luckily I found the answer. Superfoods. Yup, and I don’t just mean kale, blueberries, and wild Alaskan salmon. While those are great, I’m referring to delicious plant products that are vibrant, nutritionally rich foods that offer tremendous dietary and healing potential. Superfoods are basically foods that are much richer in vitamins, minerals, nutrients, electrolytes and phytonutrients, and are much lower in calories. Because of this, they nourish our bodies on a very deep level, and are naturally packed with energy and mood-enhancing benefits. By far my favorite superfood, coined the “food of the Gods,” Cacao is harvested from an indigenous American jungle tree, is pure chocolate from the cacao bean (without the milk or sugar) and is one of highest anti-oxidant foods on the planet. Raw chocolate improves cardiovascular health, builds strong bones, speeds our metabolism, is a natural aphrodisiac, elevates our mood and energy, and increases longevity. 2.5 TBSP of raw cacoa powder has 70% more magnesium, 85% more potassium, 20% more iron, 75% more fiber, and 60X more antioxidants than 1 packed cup of spinach (Source: Navitas Naturals). I like to blend a TSP of cacao powder in my morning smoothie for a clean energy source that will last all day long. Try my LIV Superfood Power Protein smoothie. Be careful not to overdo it – this stuff is strong! My recommended daily consumption is 1 cacao bean per 17-22 pounds weight. Maca is an Incan Superfood, also referred to as “Peruvian ginseng.” Prized for it’s energy boosting properties, and also very beneficial for hormone balance and thyroid disorders. Maca can be used for balancing hormones in both women and men, while also enhancing fertility. Use in moderation, as maca can be a strong energy and mood boosting superfood, while also enhancing strength and stamina. I typically add a teaspoon of maca powder to my morning smoothie or mixed in with homemade almond milk and hemp protein. Goji berries are prized in Asian cultures as the “fountain of youth” berry. This berry is an “adaptogen,” a term used in the world of medicinal plants to describe a substance with a combination of therapeutic actions on the human body. An adaptogen invigorates and strengths the system, while helping the body to deal more easily with stress (Source: Superfoods by David Wolfe). Because of this, goji berries have been known to harmonize the energy of the adrenals and kidneys, resulting in enhanced energy, stamina, strength, and longevity. I eat goji berries raw or add goji powder to smoothies to experience their many benefits. Hemp seed and oil is probably the oldest industry on the planet, going back more than ten thousand years. Hempseeds are packed with 33-37% pure digestible complete protein, with all of it’s original life-force energy and enzymes in tact (Source: Superfoods by David Wolfe). Plus, they’re packed with monounsaturated omega 9 fatty acids which are considered a healthy energy source for brain function and a quality beautifying oil. I love this protein powder in my smoothies. It’s easier for our bodies to digest and assimilate than other forms of protein, and I’ve found that it provides a clean sustainable energy source that lasts much longer. Spirulina is a blue-green algae found in cold water lakes that is incredibly high in protein and a great source of antioxidants, B-vitamins and valuable nutrients. Because of the high concentration of protein and vitamins, Spirulina has been coined one of the most nutrient foods on the planet. It is also incredibly high in chlorophyll, which cleanses our blood and strengthens our immune system. In addition, spirulina can power better workouts and is known to increase fat burning during exercise, while reducing oxidation which leads to muscle fatigue. A little goes a long way and because spirulina is so concentrated, chances are you’ll feel the energy and health benefits from a small amount. I add 3 tsp to my morning smoothie or consume 3-6 tablets a day if I’m on the go for an extra energy boost between meetings. Chia seeds are a longevity food, often coined the “runners food” because of the long burning energy source it provides runners. Chia seeds were an important food for the Mayansfor their ability to provide sustainable energy… in fact, chia is the ancient Mayan word for “strength.” Loaded with protein, fiber, antioxidants, nutrients and vitamins – chia seeds have an important benefits for our brains and bodies. They areone of my favorite superfoods and can be added to oatmeal, yogurt, smoothies or other wet foods. They expand so my recommendation is to soak them before for the best benefits and digestion. Flax seeds and oil are one of the richest sources of Omega 3 fatty acids on the planet. Omega -3 fatty acids or “good fats” are critical for heart health and help fight inflammation, support brain function, energy production and more. Omega 3’s are also very important because they help to balance out the high percentage of Omega 6’s in our diet, which lead to inflammation and disease. Flax seed is also great for regularity and helping to keep our digestive system moving along. Eating in the morning is best, as I tend to find consuming at night may keep you awake longer. I grind up 3 tablespoons of flax seed in my coffee grinder, and add to my protein smoothie or on top of my oatmeal every morning. There are so many other incredible superfoods that you can add to your diet to boost your energy and mood levels, like coconut, bee products ( royal jelly, bee pollen and propolis), aloe vera, seaweed and more, but these are my top 7! I’ve had my fair share of ups and downs over the years. Who hasn’t? Moments of extreme joy and happiness, peppered with moments of stress, despair, anxiety, depression and lack of motivation. I truly believe life is geared that way, ebbing and flowing like a river, and teaching us valuable lessons along the way. One day, I stumbled upon Essential Oils at a Wellness Event in Long Island, NY. The woman had a full spread of essential oils perfectly arranged in neat rows on a table. When I first approached the table, each bottle looked like a precious gem waiting to be unlocked. I told her I had been stressed out from work lately, experiencing extreme anxiety, depression, and insomnia. Nothing had been working. She handed me the bottle of lavender and asked me to close my eyes and take three deep breaths. Almost instantly, it felt like I was transported to a beautiful lavender field in the South of France, and a feeling of relaxation and euphoria rushed over me. After a few breaths, I opened my eyes and my stress and anxiety levels dissolved by almost by 80% (yes they're that effective). She educated me that there were essential oils not only for stress and sleep, but for mood elevation, energy, balance, digestion, immune support, hormonal balance, respiratory support and more. Instantly I was hooked and bought 8 oils on the spot that day and couldn’t wait to tell my friends and family about these gifts from the earth. So you may be asking.... What are Essential Oils? Essential oils are natural aromatic compounds found in the seeds, bark, stems, roots, flowers, and other parts of plants. They act as the plant’s natural defense system, and simulate a similar response when we interact with them. Scientifically, they trigger our olfactory nerve which is connected to our “emotional brain” and limbic system which controls heart rate, blood pressure, breathing, memory, mood, stress, hormonal balance and more. Over time, essential oils can have powerful a healing effect on us emotionally, mentally, and physically. So what are a few of my favorite oils that I can’t live without? As I mentioned above, this is one of the most well-known, versatile scents, and is known for stress and insomnia relief. I carry a bottle around with me at all times to help combat the occasional stress we experience in everyday life. I either inhale aromatically, massage into my temples, or add a few drops to my drinking water to reduce anxious feelings. Lavender always helps to balance my mood, nerves, and anxiety. It's seriously a life-saver! At night, I add a few drops to my diffuser, my pillow, and to the bottom of my feet to help me relax before bed and battle insomnia. Lavender is also great to add to baths and is soothing and calming to skin. Peppermint is also a very popular oil with a lot of everyday uses. I use this as a “tummy tamer” or to help quell digestive upset after a meal or if I feel queasy in the car. I either ingest a few drops in purified water, or rub a few drops onto my stomach. I also diffuse peppermint in my office when I’m studying or writing – this is a great oil for energy and focus. Peppermint is also great to use topically for tired muscles or to massage into temples and neck after a long time concentrating on the computer. Lastly, this is refreshing tasting oil, and sometimes I’ll add to my LIV Superfood Power Protein Drink © | Healthy Smoothie to add a subtle minty flavor. Lemon is a cleansing and uplifting oil. I often rub lemon onto my wrists early in the morning so that I can refer to it all day long. Especially during the colder winter months when seasonal depression disorder can set in, this fresh scent is sure to uplift you. Lemon is also known to be a powerful cleaning agent. When I’m cleaning my kitchen, I add 10 drops of Lemon to a glass spray bottle with 8 ounces of purified water to create an all natural cleansing tonic. This oil cuts grease and grime, and is great for cabinets, stove, and countertops... and smells delightful (and its chemical free!). Lastly, during the winter months, I combine lemon oil and fractionated coconut oil and massage into my nails and cuticles for a daily fingernail conditioning. I call this oil “happiness in a bottle.” The minute I spin the top off and take a whif, I am in heaven. Wild orange is an invigorating scent, helping to uplift our mind and body and battle depression. For an energy boost, I mix 2 drops of Wild Orange with 2 drops of Peppermint. First I add the mixture to my hands and inhale deeply for three breaths. Then I massage the oil mixture into the back of my neck to help invigorate my nervous system. In addition, wild orange is a powerful cleanser and purifying agent. Try diffusing it the morning for an uplifting fragrance to help purify the air. I also love diffusing this scent when I'm doing chores around the house, or as a welcoming scent when guests are visiting. Wow I can’t say enough good things about Frankincense. This is coined the "king of oils" and is a powerfully uplifting scent. I love using Frankincense in the morning to kick off the day on the right thought pattern, and is also extremely beneficial during times of meditation or prayer. This is an oil I can’t live without when I’m battling the morning blues or afternoon slump. When my mind isn’t right or I'm experiencing a negative thought pattern, I’ll rub this oil into my temples, the bottom of my feet, or wrists and instantly feel the negativity melt away. Frankincense is also great for skin and can heal cuts and sores. Combine it with your favorite facial moisturizer for beautiful, radiant skin. Wanna know where you can get the highest quality, purest and most potent oils? Or, ready to shop? Visit my store! This is my go-to weekend brunch recipe that my husband and I make when we are burned out on traditional oatmeal and egg dishes. Made with steel cut oats, this recipes is naturally clean and gluten free. Topped with fresh berries, butter and maple syrup, you’ll savor the flavors long after you finish breakfast. · Optional toppings: Fresh berries, organic maple syrup and organic butter. Place all ingredients in blender. You can use larger Vitamix or two batches can fit in a Nutribullet. Pulse until batter is smooth. Heat ceramic skillet with a teaspoon of coconut oil. Once hot, pour first pancake about 4-5 inches in diameter, and about ½ inch thick. *If you make them larger than that they won’t cook in the middle and will be very hard to flip. Cook each side for about 2-3 minutes until lightly golden brown, and transfer to warm plate. Repeat until mixture is gone. Lastly, experiment with different seasonal toppings and flavors. I like to add a square organic butter on top with fresh organic maple syrup and cut strawberries, raspberries or blueberries, depending on what’s in season. This is one of my favorite warming meals, packed with bright red bell peppers, cancer fighting onions, garlic, fennel, and a pinch of red pepper flakes for a kick. Did you know one red bell pepper has more vitamin C than an orange?! I used organic and all natural bell and evans turkey sausage instead of pork. Healthier and less fat. Pair with a piece of crusty Italian bread and you’ve got a delicious meal for days. My Maternal grandmother“Nonna” used to make this for my mom to bring to school back in the 60’s.. tried and true Italian classic. Mangia! Heat Oil in large skillet over low to medium heat. Add sausages and cook until browned on each side about 9-11 minutes. Add peppers, onions, salt, pepper, red pepper flakes and cook for 7 more minutes. Then add fennel, oregano, and garlic and cook for2 more minutes on low heat. Add tomatoes, tomato paste, basil and cook for 25 minutes on low heat, until sauce becomes thickened and aromatic. Serve in large soup bowls with warm crusty bread. Top with fresh basil and serve immediately. My mom and I made this one chilly afternoon in October when cabbage was in it’s peak season. Cabbage is a green cruciferous vegetable. Cruciferous vegetables play an important role in our diets, containing the highest amount of nutrients across any other food you can consume, packed with vitamin C, fiber and phytonutrients...flushing our systems and guarding our bodies against cancer and disease. Not to mention, this dish is one of my favorite winter fares… warming, healthy and extremely satisfying on a chilly night. Very excited to share it with you! 4. After cooked for 30 mins, drain water and place in cabbage colander. Carefully peel each leaf off one by one, they should separate easily after steaming. 5. To make the stuffing, add chopped onions and 2 cloves garlic to skillet and sauté on low heat until onions are translucent. 6. Add 3-4 large chicken breast to food processor, pulse until roughly chopped. Add chicken to fry pan with onions and garlic. Cook mixture for about 10 minutes until chicken is thoroughly cooked. 8. In a large casserole dish add thin base layer of fire roasted tomatoes, chopped basil, and 1 garlic clove chopped andsprinkled on top. This is a nice base for flavor. 10. Line them in in casserole dish like “little soldiers” my mother would say. 2-3 rows depending on depth of pan. 13. Cover with foil and bake at 375 for 1 hour until cabbage is cooked thoroughly. Serve warm. A delicious, easy, healthy breakfast that is one of my staples. Especially when you’re trying to detox, this is great to have after your morning smoothie or juice to give your digestive system a rest from heavy fats and proteins. This recipe is also extremely versatile – experiment with different fruits, nuts and milks for different flavors and textures. My husband also likes to add cacao nibs which gives him a extra boost of energy and antioxidants in the morning. Packed with healthy carbohydrates, fiber, and B vitamins, this is a breakfast you won’t want to miss. 1. Place a small sauce or soup pot over medium heat. 2. Add water and oats to pot and bring to a boil. Reduce to low heat, stir occasionally, and cook for 5-7 minutes until oats reach your desired consistency. 3. Take oats off heat and spoon into to a medium sized bowl. 4. Add your coconut oil, and swirl in while still hot. Then add maple syrup, fruit, nuts, cacao nibs, milk and finish with cinnamon on top. Serve while still piping hot and enjoy! Pomegranates are in peak season and they are one of my my favorite beauty foods, packed with antioxidants. This fresh dish uses varied tastes and textures, and it’s one of my Mom’s original recipes. I made it this Christmas at my sister in law’s house and it was a hit. This salad starts with crisp, peppery arugula, tart crunchy pomegranate seeds, and toasted pine nuts. Top with shaved parmigiano cheese, olive oil and fresh squeezed lemon juice. Packed with nutrients, antioxidants, and flavor. Enjoy! · First make the dressing, combine the olive oil, lemon juice and sea salt. · Then toast the pine nuts in a small ceramic or non-stick skillet until lightly brown on each side. · Lastly, toss arugula, pomegranate seeds, parmigiano cheese, pine nuts and dressing. Serve immediately and enjoy! Some folks in the health industry call kids the achilles heel of health and wellness. Or in other words, children are the most vulnerable and most easily malleable by outside influences to adopt health and wellness best practices. And chances are, what they learn as children, usually stays with them for life. In our country, obesity is a national crisis. Over the past 30 years, physical activity has gone down and processed food consumption has gone up. It is estimated that a staggering 70% of Americans are obese, and over 40% of children are (Source: The biology of Food Addiction, Mark Hyman MD). One of the largest reasons for this is because of how our country has been operating over the last 30 years. Marion Nestle wrote a great book, Food Politics where she explains that back in the 80’s farmers received subsides from the government to produce more food. As a result, we were seeing mountains of corn in Iowa, wheat in Kansas, sugar cane in Georgia. In addition, there was a deregulation of Wall street, and corporations had to grow their profit to stay competitive – this includes Pepsi, Campbells, Fritolay, Mcdonalds to name a few. As a result, children became victims of more and more advertising for these unhealthy processed foods. Families began eating outside the home more often, and in larger quantities. In addition, according to the Kaiser Family Foundation, the proliferation of electronic devices has the average child consuming over 7 ½ hours of all screen media (TV, videos, DVD’s, computer and video games). Because of all of these factors, our countries’ obesity rate has tripled since the 1980s. The good news is that in the 21st century, there have been powerful figures like Michelle Obama and Dr Oz advocating change on how we feed our kids and teach them healthy living habits. School lunch programs have radically changed for the better, which is extremely promising. We need to maintain this momentum and take back our health for our immediate children, and in our direct circle of influence. Below are my top five tips you can do today to help the important children in your life be healthier, happier and more fulfilled. As I mentioned above, portion sizes began to increase in the 1980s and have been growing ever since. Especially in America, we’ve been trained to go for the XXL iced tea or the Venti Frappaccino, because in America bigger is better, right? Wrong. Bigger portions are taxing our kid’s digestive systems, adding to their waistlines, fueling the dangerous sugar addiction, and making them more prone to higher blood pressure, and type 2 diabetes when they are older. When feeding your children, a good guideline for portion control is to think about the concept of Institute for Integrative Nutrition’s MyPlate, which is divided plate into four sections. Vegetables and whole grains fill the slightly larger sections, while fruits and proteins fill the other sections, and fresh filtered water and healthy fats/oils help supplement every meal. Be mindful that the foods in each section should not overlap or be piled high. This will help you keep portions in check and serve more balanced and nutritious meals to your family. Growing your own garden can be a fun way to teach children about farming and where food comes from. Plus, if they helped grow it, they are far more likely to try it when it hits the dinner table. No space for a garden at home? No problem, window boxes can be just as effective. I also love these guys - Green City Growers located in Somerville, MA (if you’re local in Massachusetts). They bring the garden to you, and convert unused residential space into flourishing gardens that produce seasonal fruits and veggies of your choice anywhere the sun shines. In today’s modern family, parents and kids have busy schedules, which as led to the decline of the “family dinner.” Eating dinner together every night helps the family to bond, facilitates the exchanging of ideas, and teaches valuable social skills. We need to bring family dinners back in house, and cooking together is an easy way to ensure that. Plus, children are more likely to become adventurous eaters if they know how to cook. I always urge my clients to “eat the rainbow.” How fun is that? Try to be creative with all of the vibrant colors in fruits and vegetables, so that your kids get all of the important phytonutrients their little bodies need. My minimum recommendation is to try cooking at home and making it fun at least 1-2 days a week. Whether it’s “Taco Tuesdays” or “Meatless Monday’s,” make sure its fun and an idea kids can remember and look forward to every week. If you can’t grow your own veggies at home, try your best to buy local, sustainable produce. Buying local ensures you are eating foods indigenous to where you live, which is according to the Macrobiotic dietary theory is best for your health. And, chances are it’s more likely to be fresher, less expensive, and you are reducing our planet’s carbon footprint because the food did not have to travel far to reach you. Sustainable produce in the simplest terms is the production of food, fiber or other plant or animal products using farming techniques that protect the environment, public health, human communities and animal welfare (Source: ww.sustainable.org). Organic produce, grass fed beef free from hormones, free range chickens, recyclable packaging… these are all healthy sustainable options that are supporting this cause. Lastly, my dad and brothers always urged me to cook for the seasons. And what I mean by that is really being mindful of what is growing and ripening at the time you are cooking it. In the Northeast, we look for peas and asparagus in the spring, fresh heirloom tomatoes and peaches in the summer, root vegetables and brussel sprouts in the fall. Being mindful of these seasonal peak produce will help you get the freshest and best produce available to you, while fueling your body with the nutrients you need at the right time of the year. Exercise is crucial for kids. Kids who are active have stronger muscles and bones, leaner bodies with less body fat, less of a risk of developing type 2 diabetes, lower blood pressure, and a better outlook on life and overall wellbeing. In addition, they sleep better and are able to handle physical and emotional challenges more effectively if they are rested. Exercise also helps to strengthen their hearts, and help pump oxygenated blood to every cell in their body. As a general guideline, try to urge your child to have 60 or more minutes of physical activity each day (i.e. running, walking, active games with other kids, sports). Part of that 60 minutes a day, try to include muscle strengthening activities 3 days a week (i.e. pushups, crunches, gymnastics), and bone strengthening activities at least three days a week (i.e. running, jump roping). One of the world’s healthiest foods, kale remains a nutritional powerhouse and has too many health benefits to list. Dr Furhman, advocate of the “Nutritarian” Diet ranks Kale at the top of the list with other cruciferous vegetables to help give our bodies nutrient dense calories and help stave off cancer and infection. High in vitamins A, C and K, folate which is key for brain development and for pregnant women, packed with fiber and chlorophyll. My acupuncturist even said that kale smoothies 3-4 times a week are said to help reverse and prevent white hair. Traditional kale and my favorite Tuscan or “dinosaur kale,” which my dad says is growing in popularity. I love making kale chips with Tuscan kale as well. Very simple – all you do is de-rib the kale, lay evenly on a lined baking sheet, add a drizzle of olive oil and a pinch of sea salt, bake for 10 minutes in the oven and voila, delicious kale chips. I serve them as an appetizer or side dish to main meals. Kale salads are also a wildly popular dish at many restaurants given the “kale craze” in the last decade. My brother and I made one in Cape Cod this summer with some other leafy greens, cucumbers, carrots, and an olive oil lemon vinaigrette. Simply delicious (get the free recipe in Recipes section). Spinach is one of my favorite greens, another superfood loaded with nutrients. In my house, we go through 2-3 large bags of baby spinach a week. We love in smoothies, as a dinner side sauteed in garlic and olive oil, folded into omelettes, salads, and in the winter, I add it to soups at the very end to boost the nutritional content of an Italian wedding soup or even simple chicken soup or pastina (Italian staple). Some doctors say that cooked spinach gives us more nutrition than raw because heat reduces the oxalate content which is said to be detrimental to our health in large quantities. Frozen is convenient when you need it in a pinch, but I always prefer fresh as the flavor is stronger. Another popular cruciferous green, high in vitamin C, A, folate and potassium, there is a very high chance this graces most American’s dinner tables as a popular side, casserole, or pasta dish. Broccoli looks like “mini veggie trees” and if you pick up a bunch at the grocery store and smell deeply, it smells fresh like the forest. A truly remarkable vegetable, and delicious. I like to lightly steam or blanche in the morning to have with my eggs. You can also boil, sauté steam or eat raw, and this can be a great snack mid day or accompaniment to lunch or dinner. Parsley is one of my favorite herbs. Rich in chlorophyll and vitamins C, A and folate, this can be added to smoothies, chicken cutlets, soups, a garnish on many popular dishes. Parsley also has important oils like “myristin” which help with digestion, inhibit tumor formation and neutralize certain types of carcinogens (particularly smoke and pollution). A blood purifier, parsley helps to neutralize internal body odors. Be sure to cut the leaves before adding to dishes to release essential oils. Being of 100% Italian descent, parsley is a staple in our culture and chances are it’s in 80% of the dishes I make on a regular basis. You’ll see it reappear in many of the recipes that I share with you! I prefer romaine lettuce to iceberg or bibb lettuce because of its packed with more nutrients and health benefits. Vitamin C, beta-carotene and fiber help to battle cholesterol, keep our arteries clean, and remove bile salts from our system. For that reason, this is a heart healthy green. I love romaine in simple green garden salads, caesar salads, wraps, sandwiches, smoothies, and in our family, we love romaine hearts drizzled with olive oil and a pinch of sea salt dipped in a fresh hummus for a mid afternoon snack.